TAMPA, Fla. -- Henry W. Custin stands at the front of the classroom at Hillsborough Community College in jeans and a pastel-colored shirt, collar unbuttoned. The cuffs on the sleeves are neatly turned up. Twice. He prefers to be called Hank. 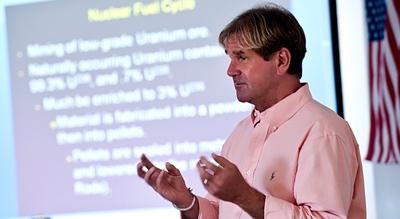 As Custin looks out over the 20 students in the Environmental Sciences class, the discussion turns to radiation and nuclear power. Deliberately, he reaches past science to connect with the students through historical events and happenings that have shaped their lives and those of their parents and grandparents. "Who was in power in Germany in 1938?" he asks. The talk spreads to World War II, Japan’s involvement and the decision by the United States to drop atomic bombs on Hiroshima and Nagasaki. The only two times nuclear weapons have been used in war. “What’s the take-home message from today,” he asks the group. “I want to somehow make it so it is relevant to them,” Custin said. Custin is the pioneer in a new teaching assistant program launched collaboratively by the University of South Florida and Hillsborough Community College. Called the “Off-Site Teaching Assistant Program,” it’s geared toward providing a new, immersive teaching experience for doctoral level students at USF. Not only do the doctoral students teach, but they are involved in developing curriculum. They also have a mentor at the school, attend faculty meetings to see the inner workings of faculty life, make presentations to other faculty, receive evaluations on their work and get to teach in a setting outside of USF. The idea for the Off-Site Teaching Assistant Program blossomed last year during a conversation Liller had with USF Provost Ralph Wilcox, who told her about similar programs he was aware of at universities in other countries. USF has a long-standing relationship with HCC, and the two institutions agreed to work on a pilot program. A retired architect from New York, Custin moved to Florida more than a decade ago. He holds a couple of undergraduate degrees -- USF and Colorado State University -- and a master’s in architecture from the University of Colorado, Boulder. He came to Florida after participating in an Evolutionary Biology program at Yale University. Custin always liked biology, and is now working on completing his doctorate in biology under the direction of Professor Thomas L. Crisman within the Department of Integrative Biology in the College of Arts and Sciences. As part of the doctoral program, he had been teaching undergraduates at USF. The opportunity to extend his impact and receive valuable teaching experience at another institution, especially HCC, compelled Custin to apply. He feels he has a lifetime of experience to share with the HCC students, many of whom are older than typical college-age students. Custin taught Anatomy and Physiology last spring, the first semester in his “apprenticeship” at HCC. This summer it’s Environmental Sciences. He’ll teach another course this fall at the Dale Mabry campus. Liller is also expanding the program in the fall, with USF doctoral students teaching at HCC’s campuses in Brandon and Plant City and another student joining Custin at the Dale Mabry campus. A fifth student will teach at USF Sarasota-Manatee. She is also discussing the program with a host of other community and state colleges in the area, and other universities. Liller hopes to continue growing the program, and expanding it to as many other institutions as possible. USF provides tuition waivers to the doctoral students, and the host institution pays a salary. Custin’s short tenure so far has been successful. His evaluations have been positive. He believes he is making a difference. Robert Wynegar, HCC Dean of Math and Science, said HCC has been very pleased with Custin’s work, and students have provided positive feedback on his teaching acumen. HCC, he said, is exploring possible grants that will help fund the program. Teaching at a community college is much different than a research university, Wynegar said. A lot of community college students enroll to receive an associate’s degree and quickly get into the workforce in their chosen field. For faculty, the emphasis is on teaching, not research. By assigning the doctoral students a faculty mentor, Wynegar said, the students are exposed to the other demands made on faculty outside the classroom.